CAMBRIDGE — The most revealing thing about Elizabeth Warren’s new book is all the material she left out. 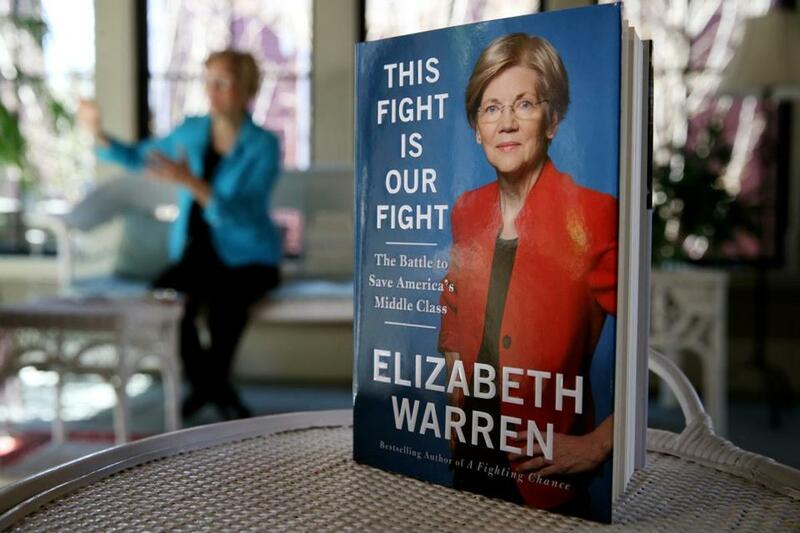 In “This Fight Is Our Fight,’’ which is Warren’s 11th book and is set for release Tuesday, the Massachusetts senator trains her scrappy prose on corporations and Republicans while notably pulling her punches on the Democratic Party’s stunning failures of 2016. She dispatches her decision not to run for president in little more than a page. She forgoes any autopsy of what Hillary Clinton and the Democratic Party got wrong. She doesn’t even mention meeting with Clinton in Washington to discuss her prospects for joining the ticket as Clinton’s vice presidential pick. Instead, Warren has produced a policy-focused (or, in her word, “nerdy”) book that is reflective of a politician whose future could depend on preserving Democratic alliances. Put another way, this is no Bernie Sanders-style screed. In a rare interview at her home in Cambridge on Friday, Warren explained that she wanted to focus on how American government has stopped working for all but the very wealthiest citizens and corporations, and her worry that President Trump “is about to deliver the knockout blow” to the country’s floundering middle class. “I think it’s time to look forward,” Warren said. 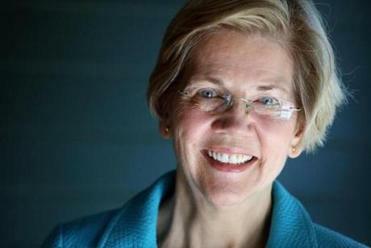 In Warren’s case, forward means her 2018 reelection campaign in Massachusetts, upcoming Washington battles with Trump and Senate Republicans — and maybe, though she will not discuss it, a 2020 bid for president. Pressed on why she doesn’t use the opportunity of a well-timed book to offer a sharper critique of the Democratic Party, Warren’s answer is, essentially: Circular firing squads aren’t very productive. The new book is relentlessly on message and on brand, as was Warren herself during a 30-minute interview with the Globe. Two aides ushered a reporter and photographer through the front door and dark front hallway, past a dining room where Warren had taped a few sample sheets of wallpaper to the painted wall. Where her 2014 book — “A Fighting Chance’’ — was more autobiographical introduction, this next installment in her “Fight’’ series is a narrative version of her populist world view, though it, too, is sprinkled with details from her financially fraught childhood and her own struggles as a young mother trying to go back to school. “This is my life’s work. This is what I was talking about long before any politics were on the horizon, and it’s what I’ll keep talking about,” Warren said. She sat on a white wicker swing that once hung on the porch of her grandparents’ house in Wetumka, Okla., and is now in her home’s sunroom. The aides remained close by. The 67-year-old former Harvard Law professor asserts in the book, and backs it up with data, that American life was pretty good for the middle class in the days of FDR until about 1980. The government worked on behalf of the majority of Americans; the rewards of economic growth were shared widely, she argues, while noting that African-Americans did not share in many of the rewards. Then came Ronald Reagan and trickle-down economics. Senator Elizabeth Warren at her home in Cambridge. “And now, Donald Trump is in place and has assembled a team of billionaires and bankers that are pushing one blow after another to working families,” she said in the interview. Speculation about Warren running for president started almost as soon as she defeated incumbent Republican Scott Brown and won her Senate seat in 2012. She addresses it in the book by recounting a conversation with her husband, Bruce Mann, one night in 2015, as they sat on the couch, she wrapped in a fuzzy red blanket, preparing to go to bed. The book’s overall thesis suggests that Warren is not enamored with the economic message delivered by the Obama administration, and subsequently pushed by Clinton. But she stops short of explicitly saying this strategy lost the Democrats the 2016 election. She also sheds no new light on her reasons for withholding her endorsement of Clinton in the Democratic primary race until nearly the end, when it was virtually over. She simply repeats the talking points she used at the time, when she said she didn’t want to interfere in a healthy debate about the party’s future. Among the goals she believes Democrats should push now: breaking up the biggest banks. During the campaign, Trump called for restoring the Depression-era division between plain-vanilla banking and riskier investment activities, known as the Glass-Steagall Act. Warren has written a bill with Arizona Republican John McCain that would impose a modern version of those restrictions. Warren said she recently pressed top White House economic adviser Gary Cohn, a former top executive at Goldman Sachs, about the bill and whether Trump planned to make good on his campaign pledge. Cohn was supportive. Her book ends with the Women’s March in Boston in January and thus stops before one of the most memorable recent skirmishes in her battle with Republicans — when Senate Republicans, led by Senate majority leader Mitch McConnell, voted to formally silence her during debate over the nomination of Jeff Sessions to be attorney general. The moment went viral and earned Warren a round of generally favorable national press coverage — not to mention a fresh flood of campaign contributions from her national network. It also, apparently, has earned her an enduring cold-shoulder from McConnell.